Almost all winter traffic projects led by Innomikko Ltd (friction meters, road weather control systems, winter maintenance) have a strong connection to wintertime traffic safety. However, the traffic safety aspect is most clearly present in projects that have a strong connection to accidents analysis and accident statistics. In Finland, traffic accident investigations are made by the police and a special accident investigation board. The investigation board’s accident analyses are much more detailed than those conducted by the police. Due to limited resources, the investigation board concentrates only on the most severe traffic accidents, in other words, deadly traffic accidents. Both the police and the investigation board accident data have been essential information sources of different statistical analyses. The winter tyres play an essential role in wintertime traffic safety. Therefore many Mikko Malmivuo’s (Innomikko Ltd) studies have had a connection to the winter tyre type and winter tyre condition safety effects. Malmivuo, Mikko 2017: The schedule of winter tyre use, and the factors affecting it. Research reports of the Finnish Transport Agency 40/2017. 32 p. + 2 app. Long abstract in English. Finnish report with English abstract. Malmivuo, Mikko, Luoma, Juha 2016: Effects of winter tyre type on roughness and polishing of icy road surfaces VTT Technology 244. 48 p. + app. 3 s. Long abstract in English. Finnish report with English abstract. Kanner, Heikki, Malmivuo, Mikko 2015: The socioeconomical consequences of ice grip approval. Client report VTT-CR-00364-15. 31 p. Long abstract in English. Finnish report with English abstract. Malmivuo, Mikko, Luoma, Juha. 2014: Studded and unstudded tires in fatal wintertime road accidents. VTT Technology 204. 33 p. + app. Long abstract in English. Finnish report with English abstract. Malmivuo, Mikko 2012: The effect of groove depth and coating of heavy traffic tyres on wintertime traffic safety. A report financed by Transport Workers Union. 31 p. + app. Finnish report. Malmivuo, Mikko 2012: Safety effects of a decreased use of studded tyres. Publications of the Ministry of Transport and Communications 4/2012. 61 p. Finnish report with English abstract. Malmivuo, Mikko, Luoma, Juha 2010: The development of winter tyre condition 2001–2010. VTT Research Notes 2554. 41 p. + app. Finnish report with English abstract. 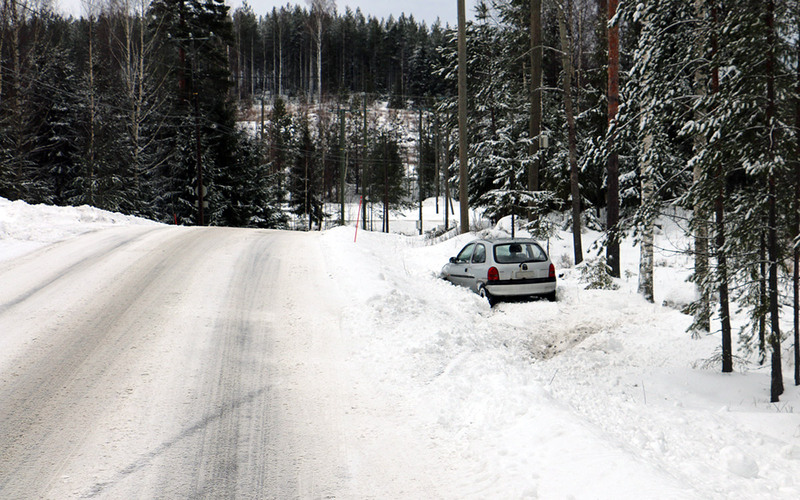 Malmivuo, Mikko 2009: Police reports of accidents related to winter road conditions. Finnish Road Administration Reports 6/2008. 48 p. + app. Finnish report with English abstract. Malmivuo, Mikko 2004: Wintertime traffic safety in Finland and Sweden. LINTU-publications 5A. 71 p. + app. Finnish report with English abstract. Report in Swedish. and Communications 67/2004. 86 p. Finnish report with English abstract. Malmivuo, Mikko, Kärki, Otto 2002: Winter road conditions and accident risk. Finnish Road Administration reports 39/2002. 65 p. + app. Finnish report with English abstract. Malmivuo, Mikko, Mäkinen, Tapani 2001: Winter tyre research 2000-2001. Finnish Road Administration reports 34/2001. 42 p + app. Finnish report with English abstract. Malmivuo, Mikko, Peltola, Harri 1997: Traffic safety at winter time. Statistical analysis 1991-1995. Finnish Road Administration reports 6/1997. 71 p. + app. Finnish report with English abstract.